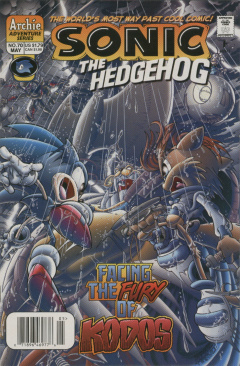 Sonic the Hedgehog 70 is the seventieth issue of the Sonic the Hedgehog comic. This issue features two stories, the main story, titled "saving nate morgan", and the back-up story, titled "Statue of Limitations". In an act of quick thinking only Sonic the Hedgehog is capable of, Sargent Simian's grenade is tossed high into the air, where it explodes upon reaching the juice bar's skylight. Everyone is safe, though a bit worse for the wear post-brawl, but the juice bar is completely wrecked. The bar's owner verbally lashes out in anger at the absent Nate Morgan, while Sonic maintains Nate was targeted because of his scientific knowledge. The owner is not interested in the story, telling Sonic to go tell the Secret Service, waving him off. Sonic will do one better than the Secret Service, as he and the Freedom Fighters march towards Castle Acorn to inform the King. Meanwhile in the castle's throne room, the Secret Service is telling informing the King of the prison break at the Devil's Island Gulag. Geoffrey St. John insists that the prisoners crashed and perished, just as Sonic and the gang drop in and deliver the contradictory news. Doctor Quack corroborates this with evidence provided by the imprisoned prison guards. Deducting that Snively and his gang are on Big Kahuna Island, Sonic and his friends hatch a plan to rescue Nate and recapture the prisoners, only to be stopped on the orders of King Max. With the Kingdom no longer at war with a powerful enemy, the crown no longer expects nor wants children to do fight it battles. The rescue operation will be spearheaded by Geoffrey with his Secret Service, and the Knothole Village Freedom Fighters are officially disbanded. A few hours later, a submarine emerges next to Big Kahuna. Geoffrey's troops emerge from the depths, while Geoffrey debriefs the team on the climb up. Big Kahuna Island, aka West Robotroplis allegedly housed dangerous Robotnik-built experiments. At the top of the climb, Geoffrey is surprised to find Sonic is already on the island, mockingly waiting for Geoffrey to catch up. Sonic offers his services as a "Free Agent". Sonic is allowed to remain, but only under the condition that he be a team player and yield to Geoffrey's command. But Sonic objects to Geoffrey's plan, which is to simply surround the facility and order their surrender, as that would make Nate a hostage and put him further in peril. Geoffrey is not terribly concerned with Nate's safety, he is an Overlander, a race which Geoffrey openly disdains. This admittance of prejudice is enough to prompt a physical spat between the hedgehog and the skunk, but the fight is quickly broken up by Prince Elias, who had discreetly joined the expedition as a helmeted soldier. Inside the compound, Nate is given once last chance to join Snively and his gang "Or else". Nate chooses "Or else". As Kodos readies his ax, Bomb bounces inside ready to blow. He fizzles instead. Sonic leads the rest of the team in a surprise charge. In a faraway place, space, yet another satellite is brought to life. A mysterious voice initiates its startup procedure: "R-Sat Unit back online. Commencing System location of target. Target acquired, system locked, and beginning activation... NOW!" Down below, the fight continues, this time with Sonic and the Secret Service having the upper hand. Just as Nate is freed from his captives, an earthquake disrupts the battle. A giant mechanical mutant emerges from the rubble, causing everyone to flee. Bomb, however, is caught in its grips, where he counts down and explodes, defeating the creature. A renewed bomb emerges from Heavy, most of the crooks recaptured and all seems well... Until Sonic and Geoffrey spot Predator Hawk, Arachnis and Kodos, making off with Sonic's bi-plane and the remains of Crocbot. Sonic is flying his bi-plane high above Sandblast City, when suddenly his ride completely disintegrates. He plummets, plummets for what seems like hours, until he spots beneath him the statue of himself that he had to smash to escape from the city. It is laughing at him, mocking his very existence. Then he wakes up, in a sweat, questioning why this dream keeps recurring. Tonight, he is resolved to see the dream through, so he falls again, literally diving into the mouth of madness, breaking it once again. After that the dream transitions and he looks around, very confused by the sight that now surrounds him. Everything, the leaves on the trees, fire hydrants, trash cans and flowers bears his face. He is solicited by a Mobian fanboy, who offers him a Sonic branded T-shirt. The Mobain promptly recognizes Sonic as the real deal, and he is quickly surrounded by hundreds of other T-shirt-wearing fanboys, all wanting to meet Sonic the "Legend". Sonic wades his way through the crowd, wanting to know just what the heck is going on. He had never been to this strange land before; he just wants to know how everyone knows who he is. The Mobian fan shows him the door of the "Sonic Adventure Archivists". Sonic awakens in a scream. Tails joins him as he sits on his bed in depression. In a moment of candor, he admits to his friend that he's not sure what this hero business is all about. He regrets leaving Sandblast City to be ransacked by the Robians, and he's just not comfortable with all this responsibility, all this burden. Tails tells him to think instead about all the lives he's touched. Being a hero is not about being perfect; it's about being a caring person who goes where he's needed. Tails doesn't know where he would be without Sonic, he's his best friend, his hero and his brother all rolled into one. This cheers Sonic up, and the story ends on a framed picture of Sonic, Tails and Sally. The title of the lead story is an homage to "Saving Private Ryan", the Academy Award-winning blockbuster film from 1998.